6:30 pm - 12:00 pm. We are thrilled to invite you to the opening of one of the most inspirational exhibition of this year "Codes Of Faith" where art serves as an universal language that celebrates diversity and unity. Be prepared to get into the true festive spirit of Christmas as Laura I. 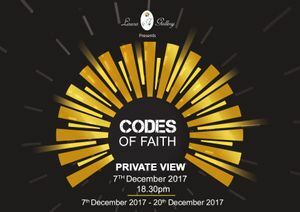 Gallery is delighted to host "Codes Of Faith" for the second year running.Opening on the 7th of December 2017, it is one of the most inspirational art exhibitions of this year. 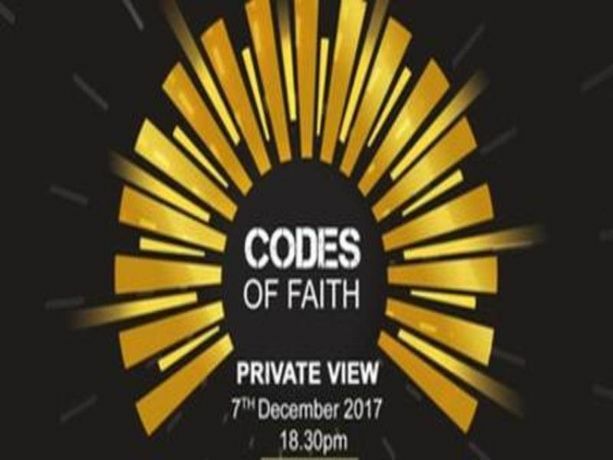 Curated by Laura Iosifescu "Codes of Faith" is a group exhibition displaying artwork on the theme of faith, from over 30 of the most exciting contemporary artists right now, to rejoice in diversity and celebrate peace and hope. "Codes of Faith" examines how artists choose to approach the purposely broad umbrella of spirituality very individually according to their own diverse histories. There undoubtedly are countless meanings to take away from this extraordinary exhibition and hopefully the influential images and context will stay with people who have visited for a long time. By prompting dialogue and encouraging interdisciplinary exploration, "Codes of Faith" will ring in the holiday season in a truly thought-provoking and meaningful extravaganza. Artists / Speakers: Cllr.Saima Ashraf, Laura Iosifescu.